Sand Boas are easy snakes to care for as long as their requirements of security and temperature are met. Differences between species will be noted in the individual pages for each taxon. Sand Boas are small snakes and therefore only require small cages. Many species do not outgrow the standard ten gallon aquarium. I prefer plastic shoe/sweater boxes because the are lighter, easier to clean, cheaper, and unbreakable. While it is difficult to see your pet through the are non-transparent shoe/sweater boxes, Sand Boas are rarely out from cover anyway, and I think the opacity of the plastic boxes gives the snake an added sense of security. Of course, sweater boxes do not provide adequate ventilation so you will need to put some (many) holes in all sides of the boxes. I make a hole about every inch around the top two thirds of the sweater box, usually in 3 rows about one inch apart. I have used a drill to do this, but I currently use an inexpensive soldering iron with a 1/4 inch tip to melt the holes (it is neater and you don't break the plastic). If in doubt, more ventilation is better than less! Make sure the holes are about half the size of the head of the smallest snake you will house in that cage. 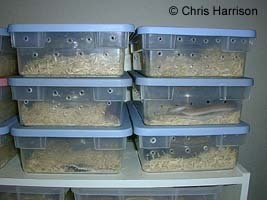 Most of my sand boas over the years have been housed in plastic sweater boxes in traditional snake racks. I am currently using racks that I made for Rubbermaid 12 gal boxes. These racks were made from shelving units available from System Works shelving (which I get at a local Lowes Home improvement center - what I like about these shelves is that they are precoated with melamine and all I have to do is screw them together. I am incompetent when it comes to wood working and these shelves happen to be predrilled so that they just fit a Rubbermaid tub with no lid). I run a strip of Flexwatt heat tape along the back of each shelf and plug it into a rheostat to lower the power output. A proportional thermostat would also work and would give more precise control. I have also kept adult sand boas in Vision cages. I find these cages easy to deal with and even the smallest of the Vision cages is large enough for any pair of sand boas. However, I have had to change the glass of the front of the cage. 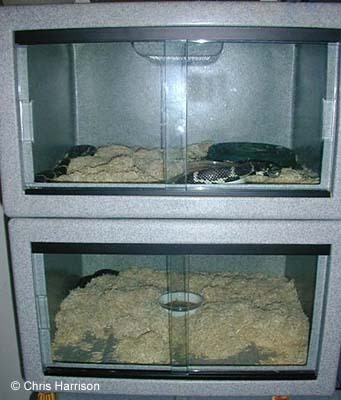 Vision cages come with two pieces of glass in a glass track and the space between the two pieces of glass is a large enough for a small sand boa to squeeze out. So I replace the two pieces with a single piece of glass. I attached handles to the glass so that I can easily lift the glass out of the track. (I have also found this works well for Gray-banded Kingsnakes and Milksnakes, both of which are master escape artists.) In the photo below, I show the cages with the standard glass panes. I have recently moved some of my sand boas over to the rack systems built by Freedom Breeder. I am very pleased with the both the quality and ease of use of these racks, although I acknowledge that it is hard to maintain high humidity in them. This isn't a problem for sand boas, but for other species it may be a concern (I would suggest covering part of the top screen with plexiglass, etc. to increase humidity for those species that might require it). I also like that these racks can be ordered with strip of heat tape already installed under the back of the rack, allowing you to set up a heat gradient with ease (I prefer the narrow 3" heat tape strips rather than the wide 11" strips). This is a contentious issue about which I have received a lot of questions over the years. I prefer Aspen shavings to other media. They don't have an overpowering odor and are easy for the snake to burrow in. Even the most dedicated burrowers among my snakes readily accept the Aspen shavings as long as they are deep enough (usually at least twice the depth of the snake's body). The weight of the substrate pressing down on the snake is important to their sense of security. Because the snakes appear to sense this weight above them, a heavy substrate, like gravel need not be as deep as a light substrate, like Aspen shavings. I have also recently tried Carefresh bedding (a by product of paper production) but I have found it doesn't hold the burrow shape as well as aspen shavings. Many breeders keep Sand Boas on paper towels or newspaper. If you choose to do this you must provide at least one hide box (see the comments regarding hide box placement in the section on temperature). 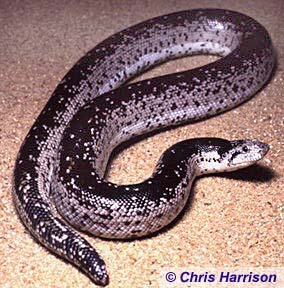 Otherwise, Sand Boas like a substrate in which they can burrow. The correct choice for your snake depends upon the species involved, but may also depend on the individual snake's preferences. Most species will acclimate to a substrate of newspaper with a secure hide box for cover, but all species will burrow if given an appropriate medium. While they are active, Sand Boas should be kept between 75� and 85�F. Some individuals like to have access to a warmer area (up to 90�F), particularly gravid females and snakes that have recently eaten. 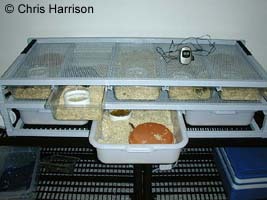 To meet these needs, it is best to set up a temperature gradient from one edge of the cage to the other. This allows the snake to choose the temperature they want. This is very important in keeping Sand Boas! Many snake will not eat predictably if they aren't provided such a gradient. The best way to achieve this is to place one end of the cage over a heat tape or hot pad that will keep the substrate at that end around 90�F. Make sure that the other end of the cage is between 72�-78�F. 1. You should measure these temperatures with a thermometer. Don't just guess at it or feel the cage and say "Oh, it feels about right". 2. 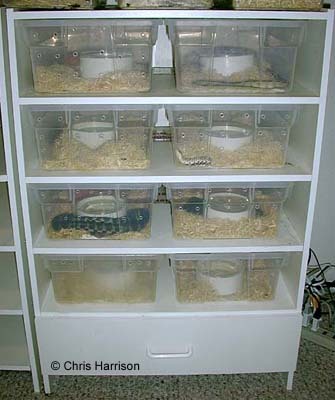 If the snake is kept on a substrate which they cannot burrow in, make sure there is a hide box at each end of the cage. You don't want your snake having to choose between a comfortable temperature and seclusion! 3. Remember that most reptiles maintain a body temperature that is more dependent on the substrate temperature than the air temperature. Because of this, their body temperature can be much hotter than the air temperature around them. Therefore it is very important that you measure the temperature of the substrate, not the air in the cage! I prefer heat tape to other types of heating arrangements. Undertank pads are also good for heating a few cages. The tape/pad should be small enough to cover 25% or less of the cage bottom. It should be placed at one end of the cage (not under the water bowl) so that the other end stays significantly cooler (measure the temp at each end occasionally to ensure a healthy gradient exists). I do not use lights to heat the cages as sand boas are shy snakes that probably do little "basking" in the wild and because reptiles in general get most of their heat from the substrate (even basking lizards!). I use rheostats with my heat tape (plug in or inline dimmers) which allow me to reduce the heat output of the tape (most heat pads/tape are too warm in my opinion). I make sure that my sand boas have access to water all the time, although I have rarely seen any of them drink. There are some that feel that constant access to water is unnatural (and possibly harmful?) to such desert dwelling species, but I have been keeping desert dwelling snakes with water bowls at all times for over 20 years and have never had a problem. For water bowls, I have used a variety of commercial plastic water bowls, but I now use disposable plastic deli cups which I set into a short section of PVC pipe to support it. 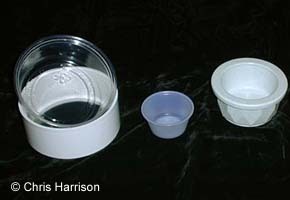 The advantage to this system is that I never have to wash water bowls, I simply throw them away and replace them (I didn't invent this, I got the idea from John Hollister's web site). For babies, I use plastic condiment containers (you can buy these and deli cups at most restaurant supply houses). 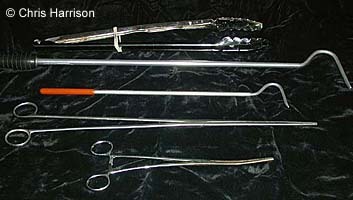 A few of the other tools I consider crucial to properly caring for reptiles include snake hooks (for manipulating snakes), long tweezers or hemostats (for presenting food items) and a separate pair of tongs for spot cleaning the cage. 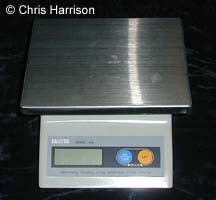 I also have a scale in my animal room for weighing food items and snakes.